A tough weekend in Monza - what was your verdict on the performance? 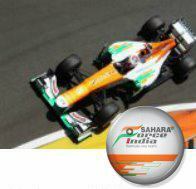 Vijay Mallya: It was very clear from the first practice session that things were not going our way. We tried different set-ups, but nothing really worked. That also showed in qualifying. In the race there were times when Adrian showed good pace, but it certainly wasn't our best weekend. How do you see the battle with McLaren unfolding? VM: It is going to be a close fight, but the good news is that McLaren still aren't that far ahead. They only scored one point in Monza, so they are definitely catchable. We need to perform better ourselves, that's very clear. We're working hard to find more performance, but at the same time we've made it quite clear that we will not compromise next year's programme. It's always a balancing act, but we know what we need to do. Singapore has been good to the team in recent years. Does it represent a fresh start after the two high-speed races? VM: Absolutely, we've been strong in Singapore, especially last year. Hopefully that will continue this year, but we know we've got to get on top of the tyres to unleash the potential of the car. Points must be the target for this weekend to keep up our momentum in the championship fight. Does Singapore still feel like another 'home' race for you? VM: Absolutely, there are a lot of Indians and a lot of our fans based in Singapore, and there's always a great atmosphere in the city. It's one of the highlights of the year, the place looks wonderful when it's lit up and I always look forward to it. How are you feeling heading into this weekend? Paul Di Resta: Given our form lately it's difficult to know what to expect. It's a track I enjoy, a great venue and we had a great result there last year with fourth place. It would be great to try and repeat that, but it's going to be tough given how competitive the grid is at the moment. How do you see the midfield battle unfolding? PdiR: There's no doubt that the tyre change had an impact on things. Plus, a lot of the teams have caught up with us for whatever reason, whether it's updates or the nature of the tracks. All we can do is keep working away to try and find some more performance. Everybody is giving 100% because we know things can change around quickly in this sport. You've always had some strong results in Singapore - is it a favourite of yours? PdiR: It's a popular race and the unusual schedule makes it interesting. I always stay on European time and that helps because you can avoid the jet lag. I will stick to my usual routine of going to bed at six in the morning and getting up at two in the afternoon because that's always worked well for me. Adrian, the last time you raced in Singapore, you finished eighth. Are you happy to be going back there? Adrian Sutil: It's not my favourite track, but it's one of those places that I've come to like more and more. There are some nice sections and it's quite wide for a street circuit, which helps with overtaking. I always enjoy street races and the city is amazing. The atmosphere means it's definitely one of the best races of the year. This will be your fifth Singapore Grand Prix, so you must be an expert at dealing with the unusual schedule by now? AS: In Singapore the night becomes your day and I've never had a problem coping with the schedule. Every year you learn more about the best technique for sleeping during the day. As for the track, you almost forget you are driving at night because the lights are so bright and clear. The visibility is perfect. What's a realistic goal for you this weekend? AS: We've got to qualify well to give ourselves the best chance of scoring points. We are still close to McLaren in the championship and we need to make sure we keep a healthy margin ahead of Toro Rosso and Sauber. Singapore can sometimes generate surprises and there's always the risk of rain, so as a team we need to be ready to react quickly and make the most of any opportunities.